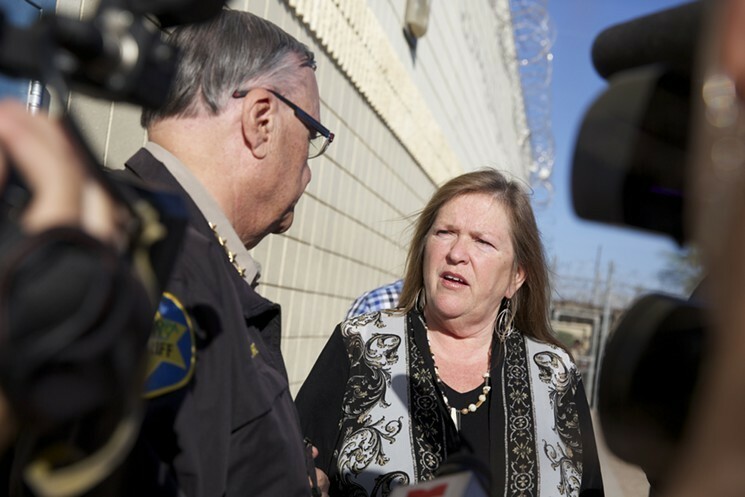 Campaigning in Arizona for her husband, Sen. Bernie Sanders (I-Vt.), Jane O'Meara Sanders on Monday visited Maricopa County's infamous outdoor tent city jail. She spoke to a contingent of reporters outside its walls in an effort to draw attention to concerns about racial profiling and what she called "inhumane" treatment of prisoners and immigrants. Maricopa County Sheriff Joe Arpaio, a right wing icon who created the prison camp in 1993 and has ridden it to national fame, surprised Sanders by interrupting her press conference. He offered her a tour of the sprawling facility, where inmates live outdoors in temperatures that can exceed 100 degrees. Arpaio further surprised Sanders by mentioning that he had Burlington ties. "I was head of [the] federal Drug Enforcement [Administration] in Burlington, Vt.," he told her, explaining that he ran the unit between 1978 and 1982 — the year after Bernie Sanders was elected mayor of Burlington. "I am a very big fan," Arpaio told Sanders, then paused for a while and resumed, "of Ben & Jerry's ice cream." "I had a little office, and we could see the cows," Arpaio said. Jane Sanders didn't buy it. "You could see the cows?" she said. "Not in Burlington in 1981. You couldn't see the cows." Sanders politely accepted Arpaio's invitation for a tour. She later released a statement decrying "inhumane conditions" at the facility. In a follow-up interview Tuesday with Seven Days, Arpaio clarified that he never lived in Burlington. He said he led the DEA's Boston office from 1974 to 1978, and supervised several field offices in New England, including a three-person team in Burlington. Arpaio, a Donald Trump supporter who has accused President Barack Obama of having a forged birth certificate, said that back then, he visited the Queen City a few times a year. He recalled working with Canadian authorities on cross-border drug smuggling and organized crime activity. He was eventually transferred to Arizona, where he put down roots, and has never returned to Vermont. "I'd like to have come back to New England and see what's going on, if I can ever get out of here for vacation," Arpaio, a native of Springfield, Mass., said. "I haven't had one for 24 years." In fact, Arpaio said, he asked Sanders during their tour if she could prevail on the company to donate pints of ice cream for his prisoners. She demurred, he said. "She's a nice lady. It was a good visit," Arpaio said, before sarcastically adding, "I'm sure [Bernie] is going to say some nice things about me."